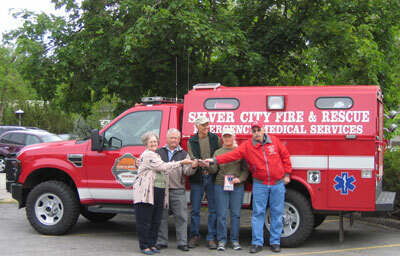 In August of 2006, the Idaho EMS Bureau licensed Silver City Fire & Rescue as a non-transport First Responder unit. The Owyhee County Sheriff provides dispatch. SCF&R provides basic emergency medical care to those in need. Last year, our volunteers donated a total of 6,132 hours on-call as a licensed Emergency Medical Services (EMS) unit. Effective fire protection for historic Silver City and the surrounding area is a long-term goal for SCF&R. There are many challenges: adequate water supply, rough roads, sufficient trained personnel, historic structures and increasing recreational use of the surrounding area. Federal, state, county and private agencies encourage SCF&R by providing equipment, assisting with training and clothing volunteer fire fighters in required protective equipment. Each day improves our ability to provide effective fire protection and emergency medical care. Silver City is a historic mining town located in Owyhee County, Idaho. Gold was discovered here in 1863 in the streambed of Jordan Creek. Hard rock mines were in operation within the first year. Silver City went through several booms and busts, and today retains 53 historic structures and plenty of Old West charm. Silver City is carefully maintained by homeowners and its few year-round residents. More than 30,000 visitors brave the 24 mile, winding dirt road every summer. These by-laws were adopted in February of 2006. Standard Operating Procedures for day to day operations and emergency calls. Requires Adobe Acrobat viewer. SCF&R uses the standard Idaho Protocols for First Responders. SCF&R was incorporated with the State of Idaho in October of 2005. IRS designated SCF&R as a 501©(3) in March of 2006. SCF&R is licensed as a non-transport, First Responder agency. The BLM manages public land in our service area. Idaho BLM Fire Program has provided assistance through grants and encouragement. Emergency Medical Services in the State of Idaho are licensed by Idaho State Bureau of Emergency Medical Services. State Fire Marshal Mark Larson and staff provide their expertise to fire departments in Idaho. You can make a big difference for SCF&R and the community by volunteering for just a few hours a month. Find out how. Support our work by buying good-looking t-shirts, caps and more. Silver City Fire & Rescue is powered by	WordPress 4.2.23 and delivered to you in 0.122 seconds using 15 queries.